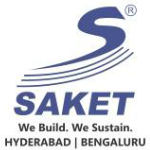 Driven with passion for quality and steered by vision to create world class housing and engineering solutions in India, Saket group has grown enormously since 1989 on the foundation of trust and confidence of many. Saket Builders holds the prestige of introducing many firsts to Hyderabad’s realty. Many concepts followed by Saket Engineers way back in early 90s have today become trendsetting guidelines to many real estate businesses. We have delivered more than 850 custom designed homes & villas and working to make 750 more families proud owners of various apartments and active adult retirement homes. Saket has emerged as a formidable brand not only in residential projects, but also in commercial, recreational and commercial sectors. We have built strong brand equity in consultancy, conceptualization, design, construction and property management services across the sectors.